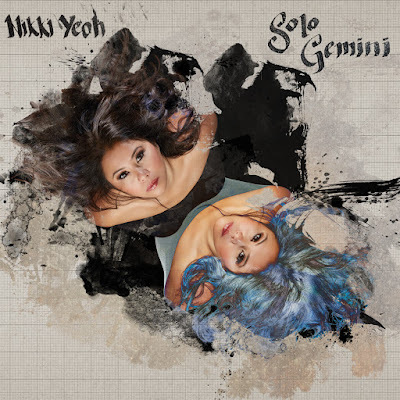 With Nikki Yeoh scheduled to perform on November 11th at Kings Place for the upcoming London Jazz Festival (link below) it’s high time to consider her long-gestating solo album, released this summer. The ironic title, Solo Gemini, gives a hint of the playfulness and wit which informs her music. London-born Yeoh has played piano for Courtney Pine and Neneh Cherry, won the Independent’s award for best jazz musician of the year — twice, dueted with Chick Corea, and performs with the Mondesir brothers as the jazz trio Infinitum. This record consists of her own compositions, played — as the title suggests — solo and represents a distillation both of her craft as a player and her musical thinking as developed over a quarter of a century (she began playing at the age of five, sitting on a stack of books to supplement the height of her piano stool). Each track represents a narrative drawn from her life, and comes with a fascinating back story. Six As 1 was composed as a companion piece to John Cage’s Winter Music for six pianos. It has a rolling jollity, and develops as an impressionist haze with dashes of colour, like fireworks through a mist. Dark chords run slipping and tumbling under the tune and there are occasional flashes of Monk, but it is more reminiscent of Denny Zeitlin, one of the most fascinating of the post-bop pianists. Powering through a range of moods of techniques, this opener is something of a tour de force. Perfectidd, in contrast, begins in an insistent and melancholy vein with a flavour of Keith Jarrett in its window-glass purity and meditative ranging over scales and sauntering bass-line. But its development is much more in the British pastoral mood, delicate and understated and naturally beautiful in a manner Michael Garrick would have recognised and approved of. What Kind? This Kind! is titled as a riposte to a musician who declared to Yeoh, “What kind of music is this? It’s not jazz.” She suggests in the CD notes that it might be considered Third Stream, “but to be honest I just call it music.” It’s tantalising, insinuating music, circling like a bee attracted to someone’s perfume, taut and concise and a little enigmatic, but concluding succinctly and attractively. Indeed, the concision of some the pieces on the album add to its strength, and appeal. Whereas Six As 1 runs over ten minutes, this track and Perfectidd make their point in just two or three. Elderflower and Ivy finds us once again in the English countryside, recalling a residency in Benjamin Britten’s Aldeburgh. The tune records personal grief while evoking the blossom on the elderflower trees, with figures of melody shifting like shadows cast by sunlight, through branches moved by the wind. Apart from an attractive cardboard cover which momentarily delays the eager listener’s attempts to extract the CD nestling inside, this is a perfectly judged album, elegant, thoughtful and impressive.